I apologize if this has been asked before. I tried searching (both here and in general) and couldn't find the information. I am considering a DCN but have a few concerns. Does the top of the cage open in any way? I assume it must, as you can attach add on units, but I'm not sure if there's a door, or if the whole top panel comes off for this purpose. I have six girls, and one does not like to be picked up. She's completely comfortable with me: I can handle her, she climbs all over me, she just panics when I move with her in my hands. To make her more comfortable, I've taught her "go home", where she scales the back of the cage and waits for me to walk over and open the top door for her, where she gets attention and treats. While I could work on this with another door, I'm concerned that every time I open the double doors to put someone in I'm going to have to work to keep everyone else in since she really takes her time to get in. The top panel does come off, but it is not something I would do on a regular basis or with rats in the cage. It is kind of a pain to get everything to fit properly, often requiring a mallet to gently nudge everything into place, so removing and replacing the panel may go smoothly or with more difficulty, depending on how tightly your pieces fit together. The newer models also have two swivel hooks that you would have to undo to remove the top panel. The side panels also may not be as secure without the top panel attached. I really wouldn't recommend going this route. Instead, I would recommend getting the exterior ramp (available from Ferret.com: http://www.ferret.com/item/exterior-ramp-for-ferret-nation-cages/651096/ ). After shipping, it usually comes to about $15 and it is worth it. I put up the exterior ramp during free range time and the rats can come and go as they please. This also gives them access to the litter boxes and the water bottles if needed. I train them to go back to the cage when I shake the treat container. I have yet to have a rat not learn this trick (some are much more quick and efficient about it though). Simply shake the treat container whenever you put them back and give them a treat near the door to the cage. Very quickly, they learn to run back into the cage, turn around, and wait for their treat as soon as they hear that shake. 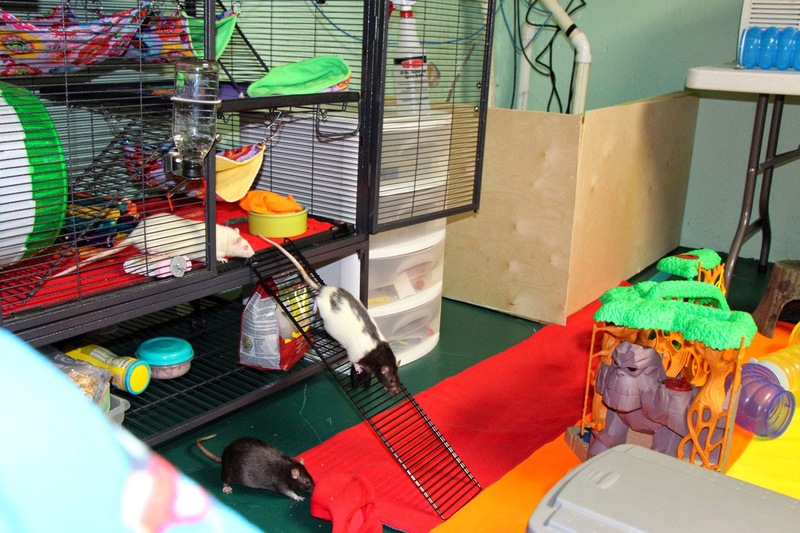 If your shy girl is one of the slower rats, you can close (fasten in the up position) the ramp to the second level and move the other more easily handled rats to the top level while you are waiting for the last girl to make her way into the cage. Once she is in, lower the ramp to the upper level to give everyone access to the whole cage again. Thanks- that's a great suggestion of closing off the top while I get Ethel in. I love your set up.